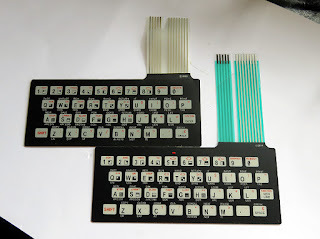 I had broken the ends of the keyboard membrane when I decided to open it once, but I knew I could replace that as there were new replacements available. Not having a power supply for it, I purchased a couple of 9V DC 2A adpaters from eBay, and rewired the end on one with a 3.5mm phono plug. Plugged it in, tuned the TV set and... Black... Geesh! Pushing the brightness of the TV to its max, I discovered that there was indeed a picture, but everything was so dark I could only just make it out. Obviously, I needed to repair this - so I looked around and discovered that the issue I have is not a faulty machine, but a common problem of a missing 'back porch'. This is essentially a problem with the very early ZX81's. Video signals were all handled (like the rest of the machine) by the ULA (Uncommitted logic array) chip. The first releases of these chips output video that lacked a small pulse that told the TV the black level of the picture (the back porch as its called). Old TV sets of that era could handle this, but modern TV's cannot. As I was looking at a mod to convert the RF to composite, I was pleased to see that two great options existed - and that they both dealt with the missing 'back porch' issue. 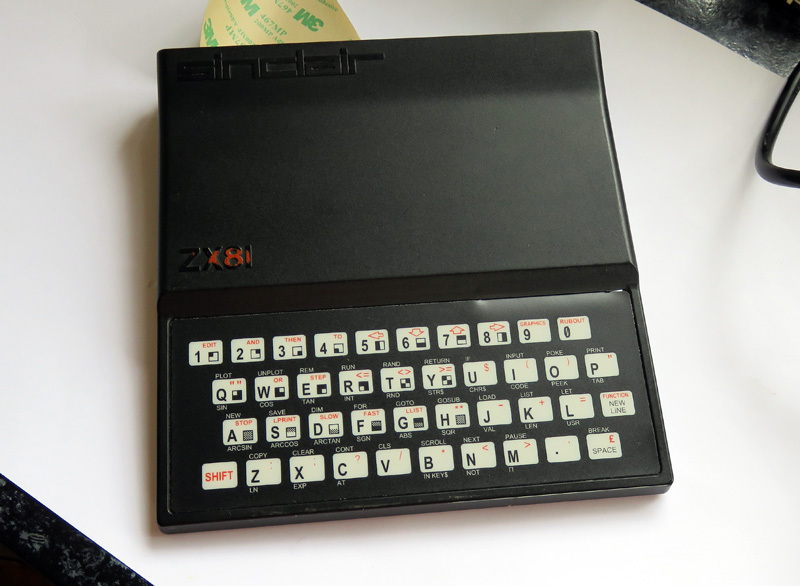 There are two options available for parts to repair/modify the ZX81. Both of these you can find on sellmyretro, from two great resellers I thoroughly recommend - RWAP software and PokeMon. RWAP sell very nice replacement keyboard membranes, and I ordered one fairly promptly. They also sell a great AV mod called the ZXVid. I could afford the membrane, but the ZXVid was a little outside my budget at the time. 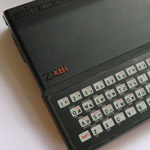 RWAP has also mentioned another great product - the ZX8-CCB by PokeMon - but alas he was out of stock. So I sent PokeMon a message - and low-behold, he was just getting in some new PCB's! The price difference between the ZXVid and ZX8-CCB was pretty large. My decision as to which to buy came down purely to economics. Once ordered, the ZX8-CCB only cost an affordable NZ$18 (including shipping). The ZXVid would have cost around NZ$78 (NZ$60 more then the ZX8). However both guys are great, and their service is awesome, so I am more then happy to deal with both of them again whenever the next replacement part is needed. So, the ZX8-CCB can be fit inside the RF casing to keep the machine looking clean and tidy. 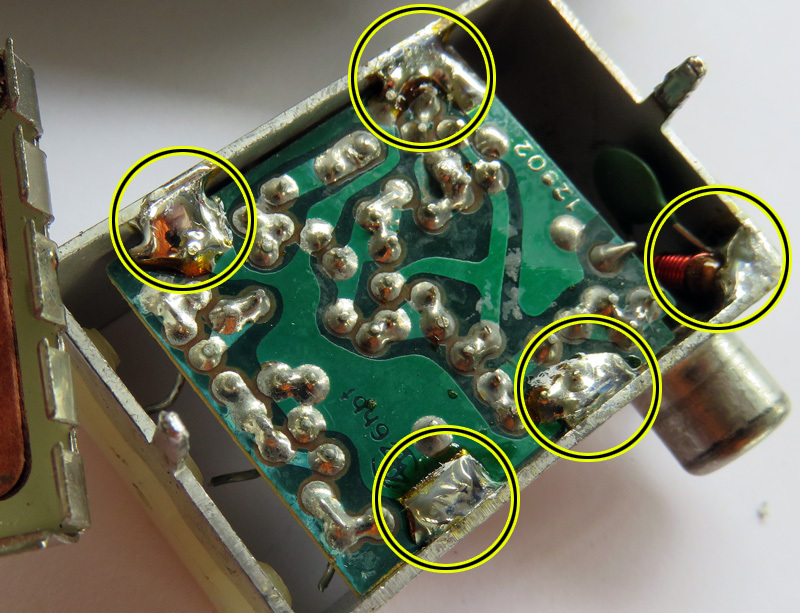 What I didn't realise was just how much of a headache gutting the RF modulator was going to be. 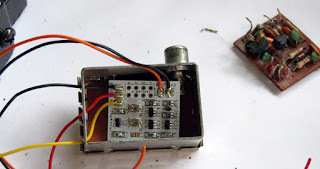 I initially opened it and thought that it would be simply a case of snipping a few wires and pulling it out, but no - I unsoldered the RF modulator from the PCB (when solder is over 30 years old, its a tough one to melt and remove) and un-clipped the cover on the bottom. 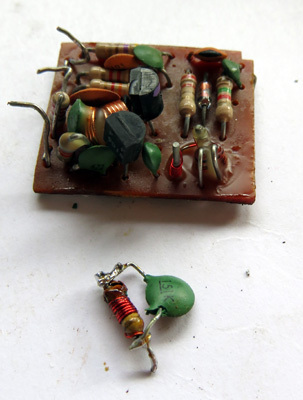 As you can see above, the RF modulator is held on by two solder joints. Argh! MORE solder - 30+ years old is pretty solid stuff! The circuit inside was soldered pretty solidly to the casing - that took a LOT of effort to remove. Luckily I had no plans on reusing this so I was ok with a little excessive hot-ironing to eat through what seemed like mounds of thick solder. Solder sucking and solder wick weren't overly useful in this instance, so a lot of leveraging with a screw driver while holding a hot iron to the joints was in order. After a good 30-40 minutes of intense wedging and heating, I'd gotten the darn thing out. 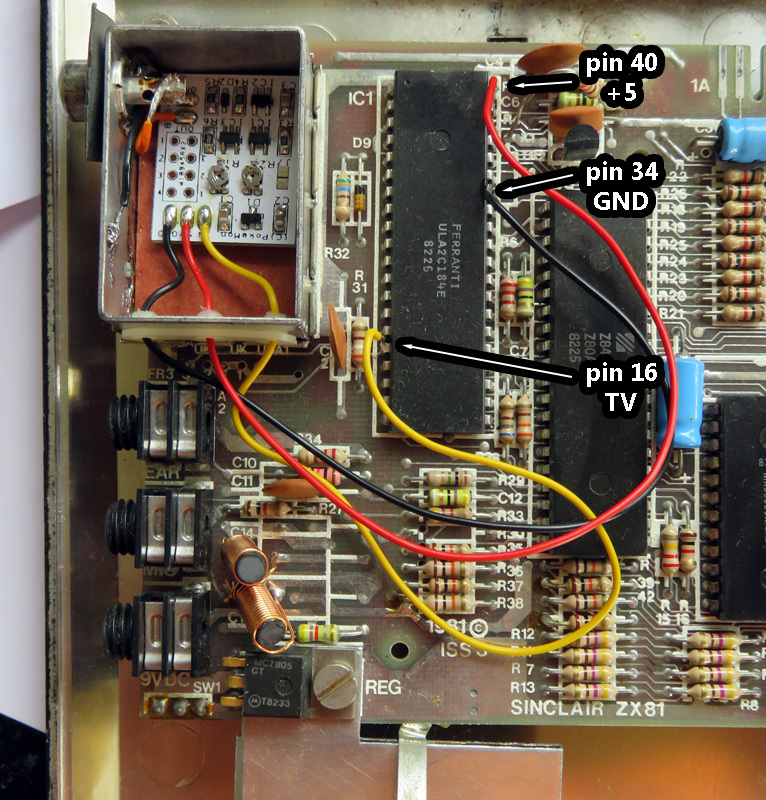 Once gutted, it was a little cramped, but the ZX8-CCB fit in fairly snuggly, I double-sided taped it to the protective paper at the bottom of the modulator. 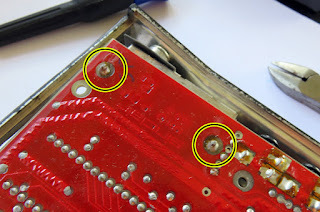 There were three holes in a plastic mount on the side of the Modulator where the bare signal and power from the ZX81 would feed into. The ZX8-CCB's wires were insulated and therefore a little too thick to pass through them, but a very small drill bit fixed that. I cut and soldered the output to the composite socket and the inside of the modulator case (ground). I fed the other three wires through the plastic side holes ready for attaching to the ULA. 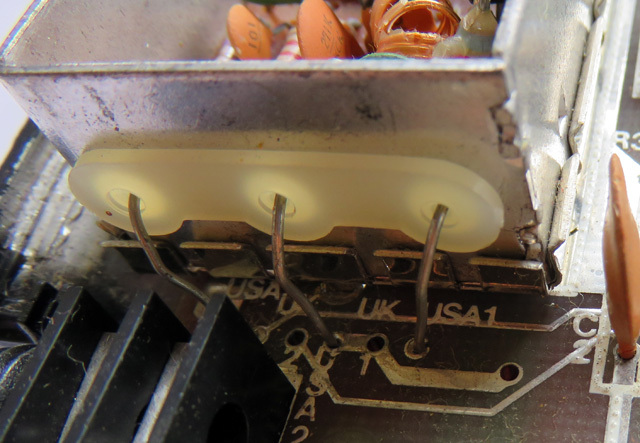 I had considered feeding the wires underneath the PCB and wire them to the pads, however I found that soldering to the legs of the ULA was a much easier process, and much easier to remove with less chance of damage should something need moving. Double-checked everything and then plugged her in. Power on... BLACK. Unlike the RF tuning, this time the black was awesomely clear... Best black ever. Still black - however the ZX8-CCB has two adjustable resistors. And I figured why not at least try adjusting them before putting things in a box and bursting into tears... A bit of fudging, turning - and wow! What a picture! Typed in the obligatory two liner print-and-goto program using the old keyboard slotted into the sockets (after trimming the broken ends of the membran) and pressed run. All great! All I had to do now is replace the keyboard with the new one (which admittedly I wondered if I had really needed to buy - but why not give it another 3 decades of life, eh!) and it would be done. 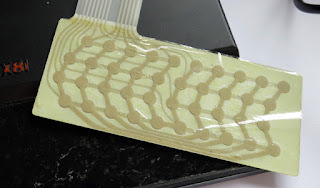 It took some work - the membrane is seriously stuck down with adhesive tape and I didn't want to damage the original (remembering the only issue was that the cracked ends of the membrane). I did manage to get it off with the plastic on the back a little loose (but still stuck (a little)). It worked (tested it with the ZX81 before closing the case) so nice to have that spare if I need it in the future. I carefully peeled the 3M adhesive label cover (the whole back of the keyboard is one large sticky surface) from the back of the new one... Fed the membrane through the hole, and then gently aligned and pressed down. 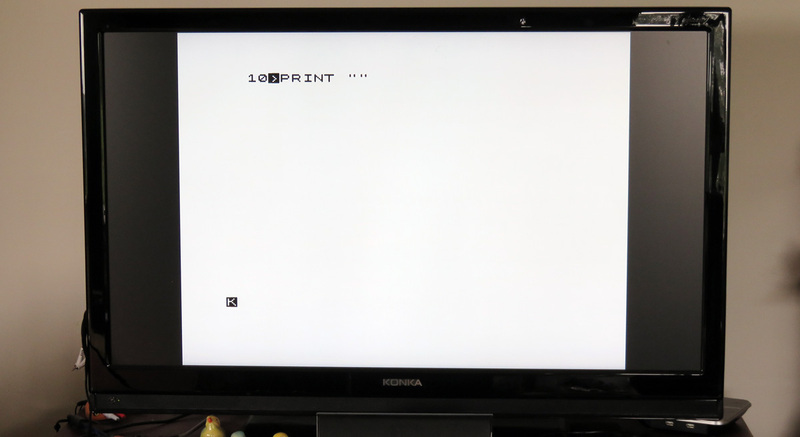 ZX8-CCB and new Keyboard - its back and working again! I closed the case, and I tested it. Viole! She's back, and she's working just great... Now where is that book of 1k games? I swear I saw it just the other day... Mind you - how many hours do I really want to sit and type in games - and I don't have any spare cassettes to save all that programming on to anyway. lol! I'm definitely a happy chappy.